To play at Lakewood St. Edward in Cleveland, one of Ohio’s most acclaimed programs, it takes toughness and a dedication to the game that not all players have. Fortunately for class of 2015 forward Kipper Nichols, he has both of those traits. The 6’6 combo forward has transitioned this year to playing almost exclusively on the wing, and the results have been very strong. Nichols has been St. Ed’s best scorer, rebounder and probably even passer throughout the season, as the team has advanced to the regional semi-finals and are heavily favored to make it to Columbus for the State Final Four. As a true Triple Double Prospect, Nichols has the size, athleticism, strength and motor to impact the game on both ends of the court. In multiple viewings by TDP this high school season, the junior has been most dangerous when securing defensive rebounds and pushing the ball for a finish or an assist. However, due to his size at the small forward position, Nichols often is called upon to guard post players, and in these situations he also shown to be an excellent defensive rebounder. 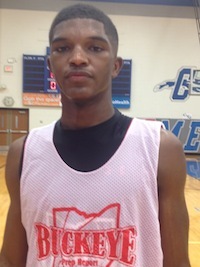 Playing for a program like St. Ed’s, and being one of the most talented members of an extremely promising group of 2015 prospects out of Cleveland, Nichols has attracted the interest of some of the top colleges in the Midwest, and beyond. Nichols told TDP that Penn State, Dayton, Xavier, San Francisco, Virginia Tech, St. Joseph’s, Kent State, Toledo are among the schools recruiting who have recruited him the hardest during his junior season. The combo forward will likely make a decision after the summer AAU session, sometime before the start of his senior year. In looking for a school Nichols, who is very strong academically, told TDP that he is comparing the quality of the educational programs among the schools recruiting him, while also looking for a team that is like a family on and off the court. Playing on a King James Shooting Stars team that is probably the most impressive squad on paper in the entire Nike EYBL, look for Nichols to have a chance to attract even more interest (and offers) from both mid- and high-major college programs. Luke Kennard – ’15 Franklin SG: Over the weekend the 6’5 offensive star, and major front-runner for Ohio’s Mr. Basketball award, became the first prospect from the Buckeye State to take an official visit to Duke in recent memory. Kennard, who is officially considering just seven schools, is rumored most strongly to be looking at the Blue Devils along with Kentucky, Ohio State and possibly North Carolina. The high scoring wing holds offers from all of these programs, and will likely make a decision sometime before the end of the school year. Judging by early reaction from the official visit, the Blue Devils could easily be considered the leader in Kennard’s recruitment, as his offensive style fits hand in glove with what Coach K is used to having at his disposal. Esa Ahmad – ’15 Cleveland Shaker Heights PF: One of the hottest prospects in the Midwest right now, Ahmad is a no-brainer first-team all-state player who has put up monster numbers in his junior season. Playing with tremendous passion and effort, the forward has led Shaker Heights back to the regionals, where they’re also the favorites to make it to Columbus. Thanks to his stellar play, Ahmad added an offer over the weekend from Indiana, giving him yet another high-major school to choose from. In addition to the Hoosiers, West Virginia, Maryland, Rutgers and Miami (FL) are some schools that Ahmad has mentioned as standing out in his recruitment. Nate Fowler – ’15 Cincinnati Moeller C: The 6’9 wide body has had a good junior year for Moeller, leading the Crusaders to the regionals and helping them become the favorite to make it to Columbus. As a true post scorer with a polished skill-set the junior has continued to rack up more college looks, and is another player who will make his decision in the coming months. A source close to both Moeller and the Fowler family told TDP over the weekend that Wisconsin, Purdue, Dayton, Butler and Davidson are currently the schools standing out to the center.